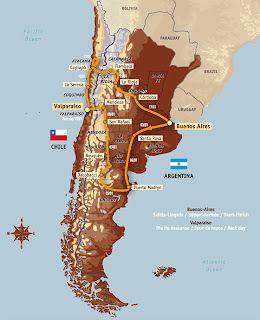 Questoverseas: Paris - Dakar Rally, in Argentina??? Have they just got really lost??? Not quite. After the disappointment of having to cancel the 2008 rally due to terrorism threats, the organisers did not want to be defeated by adversity again this year, and decided to move one of the most famous rallys in the world across the water to South America. Starting in Buenos Aires, crossing the Andes into Chile and then coming back into Argentina via the Atacama desert, 584 teams of bikes, cars and trucks began last week and are braving heat, cold, ice and sand across 10,000km of terrain to see who will pass the ultimate endurance test. Only around half will finish, and the winners will be crowned next Sunday the 18th January. The adventure began back in 1977, when Thierry Sabine got lost on his motorbike in the Libyan desert during the Abidjan-Nice Rally. Saved from the sands in extremis, he returned to France still in thrall to this landscape and promising himself he would share his fascination with as many people as possible. He proceeded to come up with a route starting in Europe, continuing to Algiers and crossing Agadez before eventually finishing at Dakar. The founder coined a motto for his inspiration: “A challenge for those who go. A dream for those who stay behind.” Courtesy of his great conviction and that modicum of madness peculiar to all great ideas, the plan quickly became a reality. Since then, the Paris-Dakar, a unique event sparked by the spirit of adventure, open to all riders and carrying a message of friendship between all men, has never failed to challenge, surprise and excite. Over the course of almost thirty years, it has generated innumerable sporting and human stories.